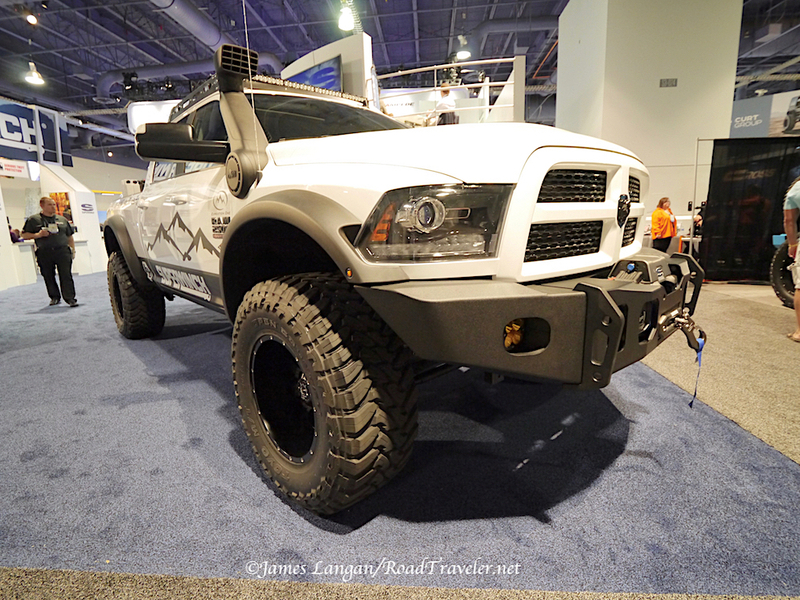 One new bumper for Ram trucks would be something to get excited about, but at the 2017 SEMA Show there were a few that grabbed my attention. 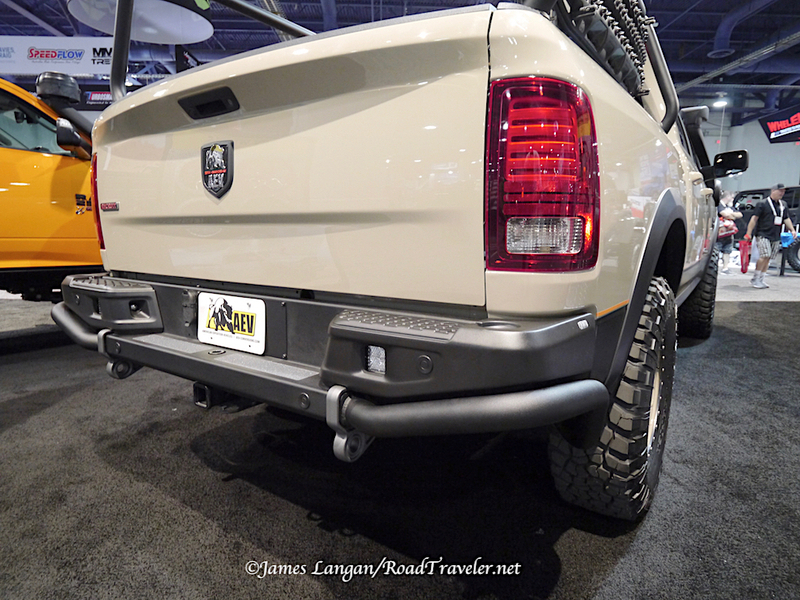 AEV finally showed their prototype rear bumper for late-model Ram trucks. There are fewer rear bumper offerings than fronts, so AEV’s version will help fill a hole. This new bumper is somewhat similar to AEV’s Jeep designs, with tubes that extend outward from the center step, under the outer wings, then turn forward and dive under the rear of the bed to connect to the frame. This should help protect the vulnerable sheetmetal behind the rear tires. 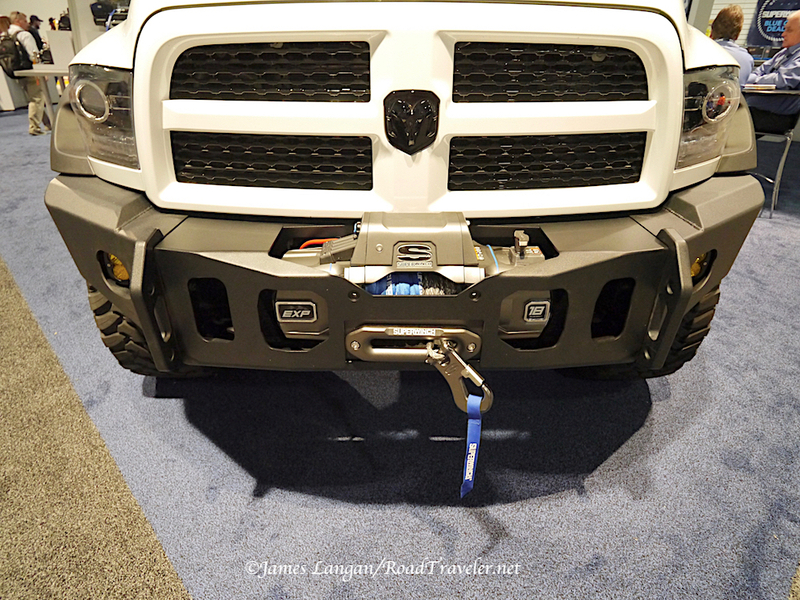 The OE hitch receiver is retained; there are spots for backup sensors, with two heavy-duty recovery shackle points that appear inspired by AEV’s front bumpers. Atop both ends, just below the taillights, are round indentations that look like they are intended to accommodate a swing-away. This was a prototype, however, AEV has a reputation for turning most things they display into regular production items. The new AEV rear bumper was shown on a 1500 Recruit. If it becomes a regular catalogue item, I’m confident they will be made to fit the 2500 and 3500 heavy-duty trucks as well. Front and center in the upper south hall, at the Superwinch booth, Expedition One showed a new prototype front bumper. 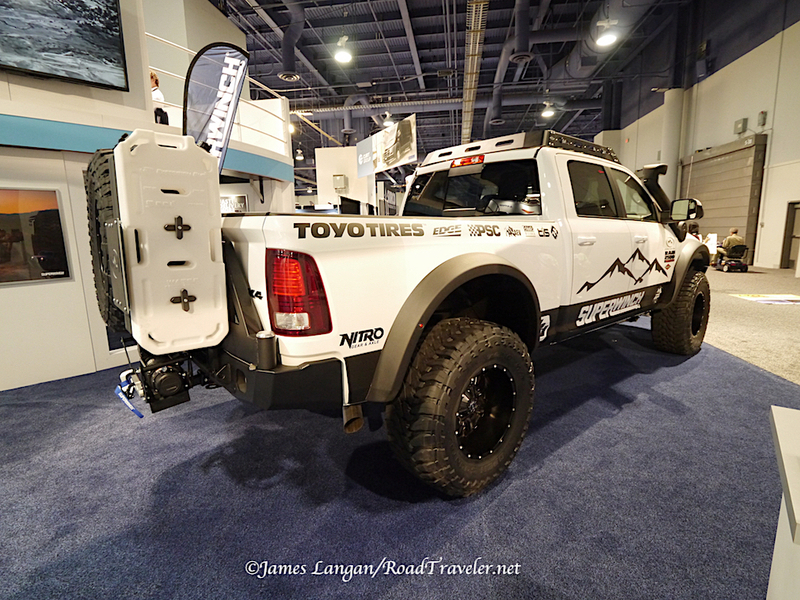 It was built to help showcase Superwinch’s new, higher capacity Expedition Series pullers. The bumper protrudes forward more than earlier Expedition One designs, likely necessitated by the massive dimensions of the 18,000-pound winch it carries. I was told that the winch sits in a removable cradle, allowing it to be added after the bumper is already mounted; a huge benefit. The same Cummins-powered Ram 2500 was also sporting a heavy-duty rear bumper, with a stout swing-away carrying Rotopax water containers (could be fuel), and a big spare tire. Warn Industries introduced full grille protection with their tube guards for full-size truck bumpers, including 1500 to 3500 Ram pickups. These grille guards will compliment Warn’s existing Ascent bumper line. Some details were not yet decided, but the large, full grille protection shown in my photo will likely be welded. A smaller, Baja-style center hoop could be bolt-on. Of course, their bumpers are made to accommodate Warn’s extensive line of winches.